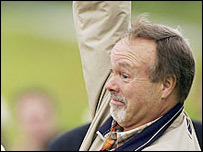 Sir Terry Matthews has retained his title as the richest person in Wales. The telecoms and leisure billionaire has an estimated wealth of £1,010m - a drop of £190m on last year - according to the Sunday Times Rich List. Kwik Save supremo and property tycoon Albert Gubay is ranked Wales' second richest with a £650m fortune, followed by businessman David Sullivan (£600m). Celebrities Sir Tom Jones and Catherine Zeta Jones have both slipped two places, taking them outside the top 10. Sir Tom's fortune is estimated at £190m, up £5m on last year, ranking him Wales' 11th richest person. Actress Catherine Zeta Jones is ranked 12th with a fortune worth £185m. Sir Terry Matthews remains Wales' only billionaire, with his fortune ranking him as the 63rd richest person in the overall list. He made his fortune in telecommunications but has invested in the £600m Celtic Manor resort in his home town of Newport where golf's Ryder Cup will be held in 2010. The list claims he has around £200m in land holdings in Canada, plus other assets through his Wesley Clover business. Two new entries make it into Wales' top 10. Duncan Cameron and Simon Nixon are joint fifth, both with an estimated family wealth of £480m. According to this year's list, Wales' richest people have seen their fortunes grow by 15% in the past year. The wealth of the 10 richest people has risen from £4,465m in 2006 to £5,153. Individuals require a wealth of £70m to make it into the Rich List's top 1,000, a £10m increase on last year. It means 25 people qualify from Wales.